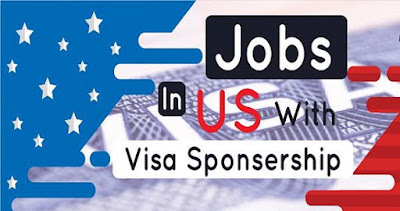 Jobs in USA with Sponsorship. If you are hoping to immigrate to the USA, you are probably hoping to find a sponsor to facilitate your visa application. One of the easiest ways to get a USA visa is to find an employer who is willing to sponsor you and to give you a firm offer of employment. If you are hoping to find jobs in USA with sponsorship, you need to have an understanding of where to start your search. This article looks at some tips and suggestions for finding a suitable employer. In order to immigrate to the USA, a visa is needed and the majority of immigrants will need an H1B visa which requires a firm offer of employment from an American employer. While this may not sound too difficult, finding a job from overseas is never as easy as it looks. Although the internet makes the job search process a lot simpler than in days gone by, there is still the interview process to get through. Add to this the extra complication of many employers having no previous experience of hiring overseas employees or no interest in taking on any foreign workers. Nevertheless, there are suitable vacancies out there for those with the right approach. While there are some industries which rarely hire staff from overseas there are plenty of companies who are grateful for foreign applicants. There are several sectors which are still suffering from employee shortages and which need to look overseas for suitably qualified applicants and these are the sorts of companies to target when looking for sponsorship. Although the shortage industries change from year to year, the current fields with numerous vacancies include nursing, physical therapy, architecture, engineering, physical sciences and technical occupations. If you have skills and experience in one of these areas, you would be well placed to find a suitable employer who will be prepared to sponsor you in your visa application. Employers who have never employed workers from abroad before may not know how to get started on the complex immigration visa application process or may not want to get involved with such a procedure. One of the best ways of finding a suitable employer to act as petitioner on your behalf is to look around for a company that regularly hires overseas staff and so is used to the process. Large corporations are often a good bet because they have plenty of prior experience and also large in-house legal teams who are experienced and skilled at employing foreign employees. Once you have found suitable companies that you think match your requirements - offering work in the field in which you have qualifications and experience and also with previous experience of hiring foreign employees, you can feel free to approach them directly. There is nothing to lose by sending a letter outlining your skills and enclosing a CV showcasing your abilities as even if there is no current vacancies, your details will probably remain on file and may be brought out again when a suitable position arises. A search online will show you a list of all the companies that hired foreign workers during the previous year, and these businesses may be the best place to start your application process. If you search the internet, you will find a list of suitable occupations which are eligible for an H1B visa application. You can identify the ones which are closest to your qualifications and experience and then search online job sites to find suitable vacancies to meet your needs. There are certain job sites that are dedicated solely to listing the latest H1B visa jobs and these are an excellent place to begin your job search. Jobs in USA with Sponsorship. There are also several recruitment agencies which cover several industries that will supply staff to overseas companies including the USA. Submitting a CV and application to these agencies is an efficient way to reach many businesses at one time and may be one of the simplest ways of finding an appropriate position that matches your skills set.